I love taking online classes. It's everything I like about a class--inspiration and community, without the things I don't like--grades and a sense of obligation. I've been having a great time with Rituals. I think it's my fav online art class that I have taken. Though I love online classes I almost never follow the suggested artistic prompts. For whatever reason I resist prompts (I am a Rebel according to Gretchen Rubin's Four Tendencies, so there's that.) Even if I psychologically resist prompts I still find that online classes inspire me to make stuff, though usually it's different than the class suggested. But so far in the Rituals class I have kept up with the prompts. I at least try to use them as a starting point. 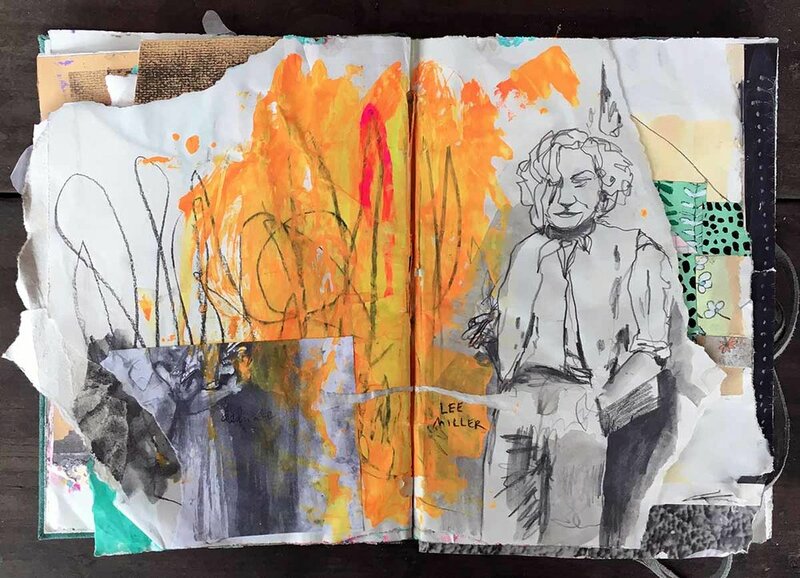 I have designated this certain sketchbook as the book I will use for the class but I am doing all sorts of other non-Rituals stuff in there too. It has a pretty cohesive vibe so far though. 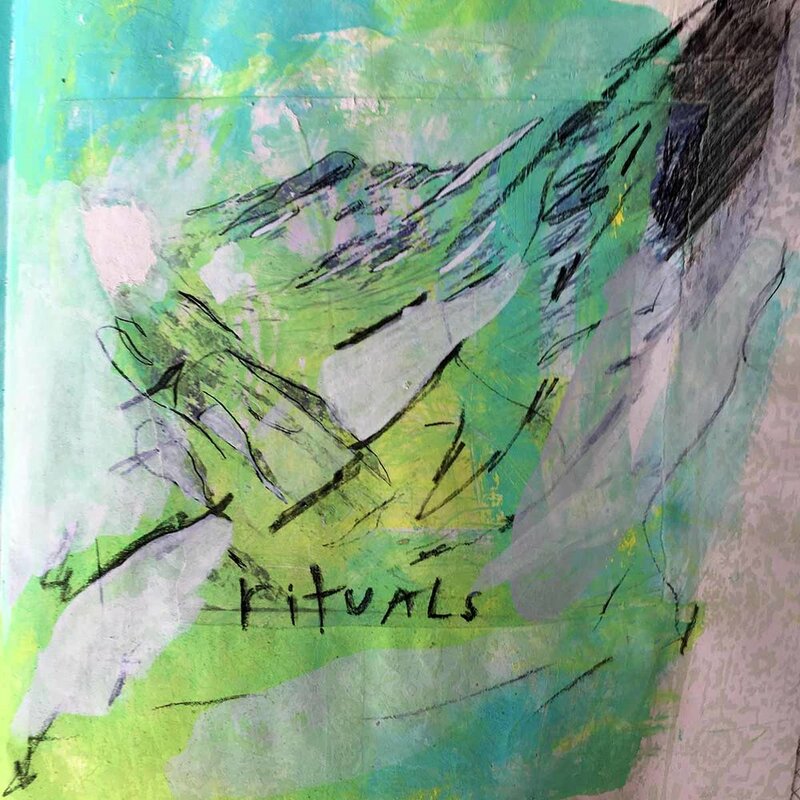 Rituals has been an exciting and very welcome sense of structure for my art journaling this year. 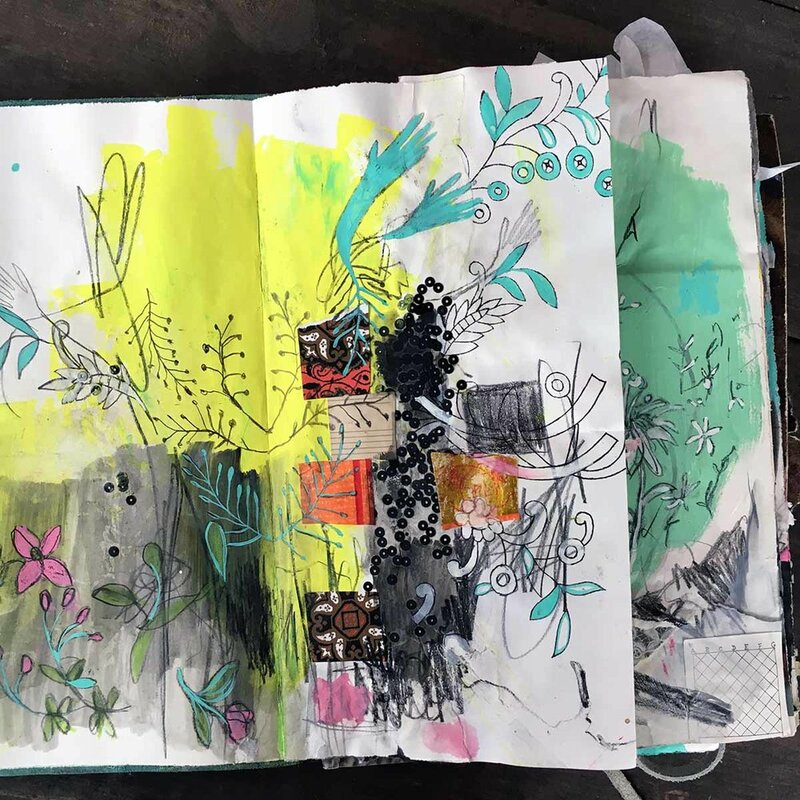 I have been a little out of my daily practice lately and this class has kept me as connected to art journaling as I can be at the moment. 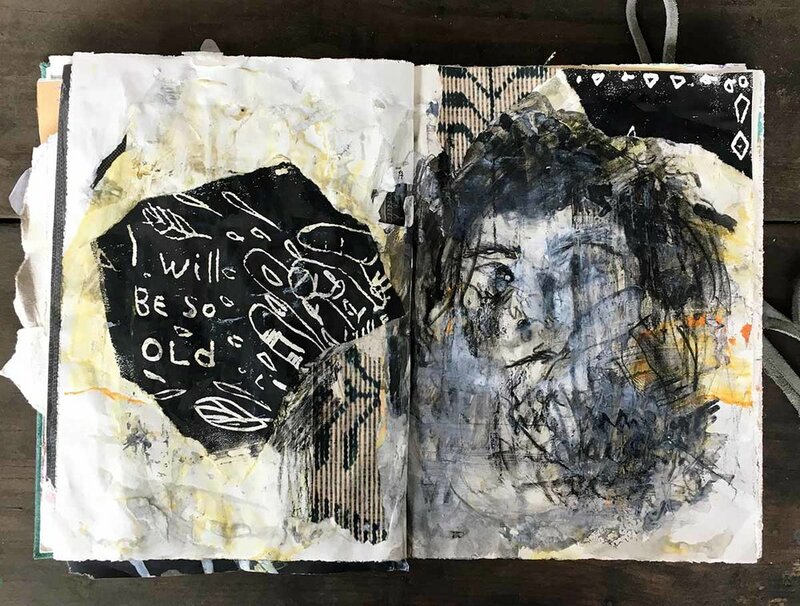 I remember I bought this sketchbook years ago at Anthropologie. Maybe it was my birthday. This book is soft and snuggly. The pages are so soft on the edges--they feel almost like a fabric. The pages remind me of Rives printmaking proofing paper. I have barely made a dent since there are so many pages--many more pages than the books I have been making recently. I wonder if I will reach the end of the book or not. The pages are very thin and I am rough on them. Often I am tearing through it or accidentally creating holes. Sometimes entire pages get ripped out. Personally, this has never bothered me much. I have always been a chaotic artist who makes "wrong" artistic choices. I know there are papers I could be using that would be more durable, or I could coat everything in gesso, but it's seriously a nice part of the process to me. Just as I am adding paint and glue intuitively, I am disintegrating the paper and creating decay intuitively as well. This was a fun thing to do for the class, creating a wheel of the year. 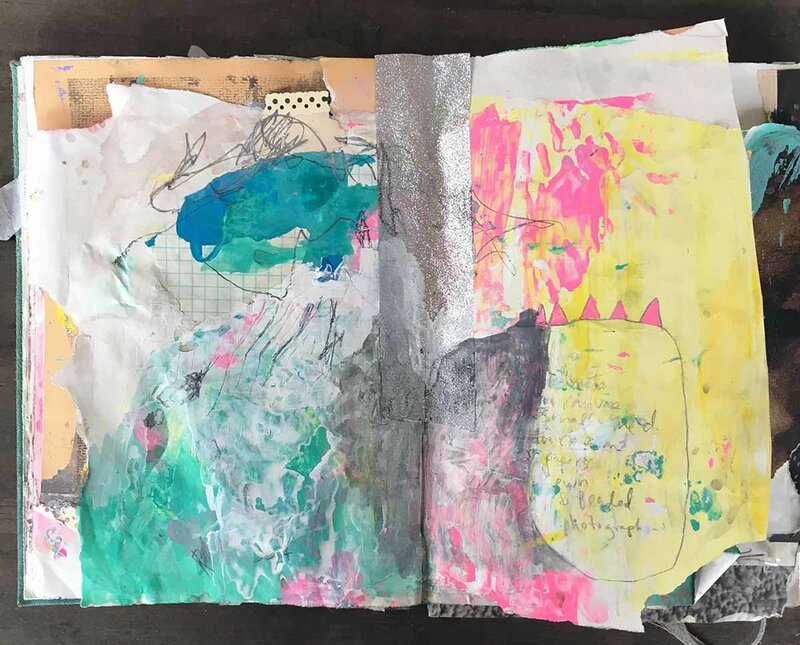 You make two wheels--one in which you set intentions for each month, and one in which you write about how the month unfolded in actuality. I had a hard time filling out the whole year. I could only set intentions for the next few months. I can barely see past that in my mind. This emerged when I was trying to get myself to make anything at all, a regular experience for me. I really liked using sequins. I love sequins. Growing up we had this old peanut butter container full of sequins and gems and it felt great knowing we had those to use. Used some magazine cutouts for the first time in a long while. See what I mean with the holes and the tearing? I like it. This was from one of the Rituals prompts. When I watched Vanessa's video I literally got out of bed and ran to my art journal to try stitching there. I have a history of stitching, in the form of embroidery and peyote stitch beadwork. I have missed it a lot lately, and it has been showing up in my paintings. Release! My "word of the year." It has really been helping me remember to finish things. I have to remind myself every day that I am the artist, therefore I am the one who decides when something is done. I imagine myself as a witch, and "DONE" I say. I know that's weird but I need a lot of help and visualization to let myself finish art for some reason. I am just working with it. 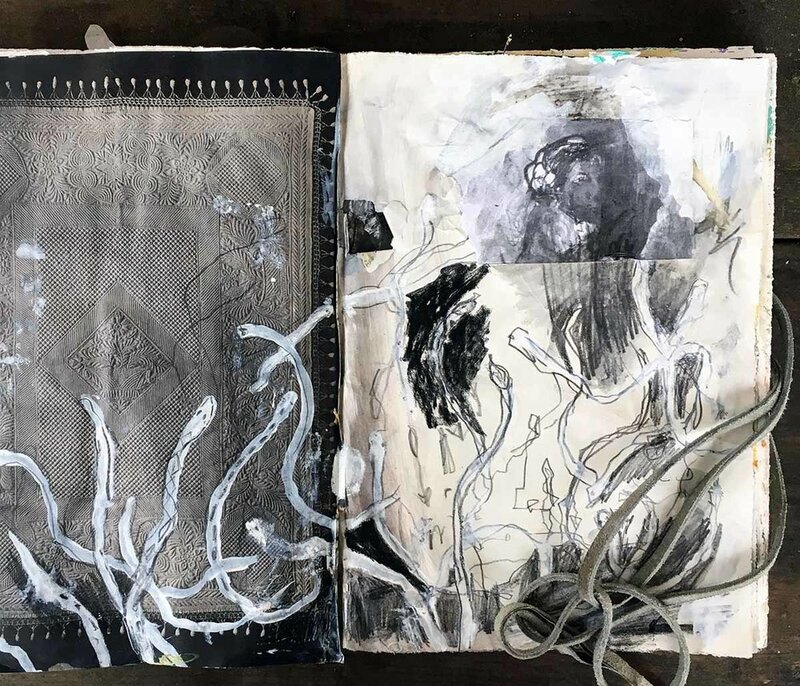 I thought this image was interesting because it shows my first concrete ideas for my recent paintings, mixing embroidery, paint, and trinkets sewn onto linen. A lot of times my favorite pages are like this, just smattered with extra paint and nothing in particular. My favorite art is work that is hard to categorize in your mind. You look at it and you can't tell what it is. But you sit there and chew on it with your mind and try to see it. It feels good. I found an old xerox of a photograph of Lee Miller that I had saved. And I drew it. Sometimes life is a pit of snakes.